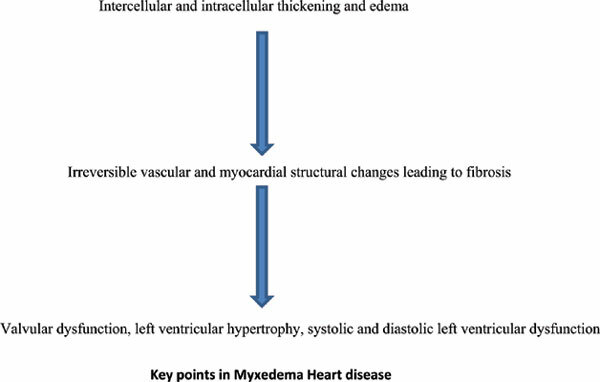 Background: Myxedema heart disease is an extremely rare disease entity and should be suspected in patients with unexplained heart failure refractory to conventional treatment. Myxedema coma with co- existent heart disease is not well known and very few cases have been reported. Conclusion: Here, we present an interesting case of myxedema coma with severe valvular cardiomyopathy followed by a concise review of the literature with special emphasis on epidemiology, pathophysiology, diagnosis and therapeutic modalities. Myxedema heart disease, brief review, heart failure, cardiomyopathy, epidemiology, pathophysiology.